Heinz Halm is an internationally renowned scholar of the Middle East, whose books, including The Shiites: A Short History and The Arabs: A Short History, have been translated into many languages. 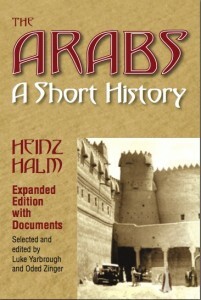 The Arabs, Heinz Halm’s masterful narrative, is now available in two versions: as a general reader and introductory text for college courses (see page 3) and, now, in an expanded version of the original edition (also available from Markus Wiener) with a new 160-page annotated appendix of primary sources. The new source appendix, edited by Luke Yarbrough and Oded Zinger, greatly enhances the text’s value for teachers as well as for general readers. Some 40 primary source readings — ranging from Spain to Iraq, from classical antiquity to the 2011 Arab Spring, and from poetry and scripture to medieval economics and travelogue — provide a classroom-ready component for courses in history, area studies, and religious studies. Several of the readings occur here for the first time in translation; all have been chosen to give vivid and representative accounts of the Arabs’ history as told by those who experienced it. Taken together, they offer readers a glimpse into the vast, richly textured mosaic of texts that have been generated by and about the Arabs and encourage further exploration. — Michael Cook, Princeton University. Heinz Halm, author (University of Tübingen) is one of the world’s leading scholars on the Middle East and especially on Shiism. His books, which have been translated into numerous languages, include: The Shiites: A Short History (also available from Markus Wiener) and The Empire of the Mahdi: The Rise of the Fatimids. Professor Halm is the editor of Die Welt des Orients, and his shorter studies have appeared in the Encyclopaedia of Islam, Encyclopaedia Iranica, and numerous learned journals. Luke Yarbrough, editor (Princeton University) researches the intersection of religious affiliation and political inclusion in the early centuries of Islam. His writing has appeared in Islamic Law and Society and the Journal of Religion, among other places. His teaching interests include Middle East and comparative history, Islamic thought, and the history and theory of inter-communal relations in the Middle East and the Mediterranean basin. Oded Zinger, editor (Princeton University) researches the dynamics and realities of married life in medieval Egypt. His teaching interests include the history of non-Muslims in the Islamic world, everyday life through documentary material, and gender and the history of the family in the Middle East. Tom Lampert, translator studied political science at Stanford University and completed his doctorate on Max Weber at Cornell University. Since 1998, Lampert has been a freelance translator and author of scholarly books and articles, including One Life (Houghton Mifflin Harcourt, 2004), comprising eight biographies based on archival material from Nazi Germany. He lives in Bad Kreuznach.